It is your responsibility to inform us if there are any special arrangements for receiving and/or unloading of consignments. This will include access for delivery vehicles. There must be someone available to sign for goods receipt unless prior arrangements have been made. Goods requiring re-delivery will normally incur a further charge. Goods should be checked immediately upon delivery and any errors, shortages or damages reported at the time. Deliveries signed for “unchecked” will be deemed to have arrived in good condition. Delivery prices are for mainland UK only (excluding Highlands and Islands). Delivery prices for other areas are available on request. If an order has to be to split into one or more deliveries you will be informed by email. Orders paid for by cheque will not be despatched until funds have been cleared. 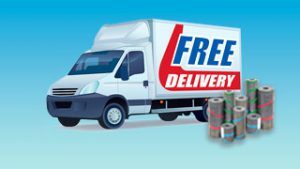 For the purposes of our delivery costs areas of the country have been split up into delivery zones. Delivery charge will be applied at checkout and prior to final verification. Zones are divided by county and are categorised as follows. Zone 1, Beds, Berks, Bucks, Cambs, Cheshire, Derbys, Dorset, Durham, East Anglia, East Sussex, East Yorks, Essex, Gloucs, Grt Mancs, Hamps, Hereford, Herts, Kent, Lancs, Leics, Lincs, Merseyside, Norfolk, N Yorks, Northants, Northumberland, Notts, Oxfordshire, Rutland, Somerset, S Yorks, Staffs, Suffolk, Surrey, Tees Valley, Tyne and Wear, Warwicks, West Mids, West Sussex, W Yorks, Wilts, Worcs. Please see Terms & Conditions for details about our returns policy.